The FTSE, CAC and DAX look set for an interesting session today with all three European stock markets up over 0.5%. Just 45 minutes prior to the open it was looking like a negative start to the day, but buyers stepped in quickly to push stocks into the black. This morning’s rally comes despite the Chinese stock market plunging to a level not seen in the last eight months. With oil prices continuing to pull back, it is unlikely to be a quiet day on markets like the FTSE. Today we have UK Net lending to individuals data at 08.30 GMT followed by US core durable goods orders at 12.30. 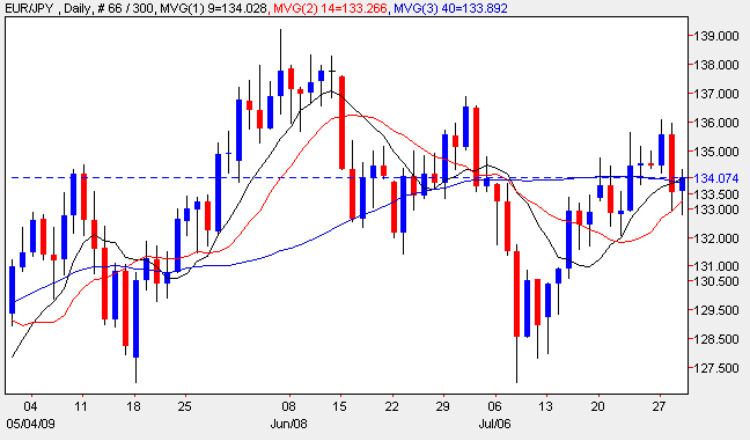 Crude oil inventories at 14.30 could cause some volatility in oil prices and commodity currencies such as the Canadian dollar. In a swift reversal of yesterday’s early action, commodity currencies are being hit hardest this morning. The Australian dollar is one of the biggest fallers against the US dollar and Yen as traders run for the perceived safety of these currencies. Outside of the commodity currencies, the EUR/ JPY is particularly under pressure this morning, but is making a recovery as stock markets get off to a more positive start. It could be a pivotal session today and the EUR/ JPY could be where the action is in the afternoon session.